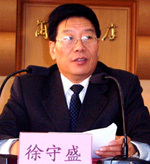 Xu Shousheng was elected governor of northwest China's Gansu Province by the provincial legislature on January 31, 2007. Xu, 54, was elected at the fifth session of the 10th Gansu Provincial People's Congress. He was appointed acting governor of Gansu last October. Xu is a native of Rudong County of east China's Jiangsu Province. He joined the Communist Party of China (CPC) in 1973. Between 1992 and 2001, Xu was vice mayor, mayor of Lianyungang City of Jiangsu, and secretary of the CPC Committee of Suqian City of Jiangsu. He became a member of the Standing Committee of the Gansu Provincial CPC Committee in 2001, deputy governor of the province in 2003 and acting governor in October 2006.